William Henry Hudson was an author, naturalist and ornithologist. 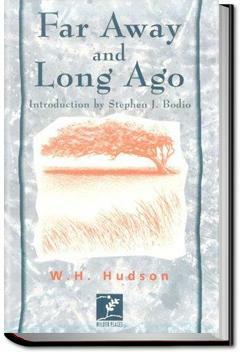 Hudson was born of U.S. parents living in the Quilmes Partido in Buenos Aires Province, Argentina, where he spent his youth studying the local flora and fauna and observing both natural and human dramas on what was then a lawless frontier. ‘Far Away and Long Ago’ is a classic memoir of a boy, fascinated by nature, on the Pampas in the 19th century. . . .ere, and during the heaviest rain the birds would sit here in their thousands, pouring out a continuous torrent of song, which resembled the noise produced by thousands of starlings at roosting-time, but was louder and differed somewhat in character owing to the peculiar song of the cow-bird, which begins with hollow guttural sounds, followed by a burst of loud clear ringing notes. Hated précis at beginning of chapters! Why? Annoying. Some stories were pointless.